How do I export from Hexawise? Learn how to export your Hexawise plans in various file formats. It is located at the right-hand side of the Hexawise screens, directly under your account name. Select the desired export format from the options provided. You can email or download the file. Hexawise Mind Maps are exported into OPML format. To open these Mind Maps, you will either need to have access to a Mind Mapping tool that reads OPML files. A list of such tools can be found on the Hexawise FAQ page. If you do not have access to any of those tools, the mind map can be emailed as an image (such as shown above). If you have used Hexawise's Auto-scripting feature, your exports to Excel and exports to HP QC will look similar to the spreadsheet below. 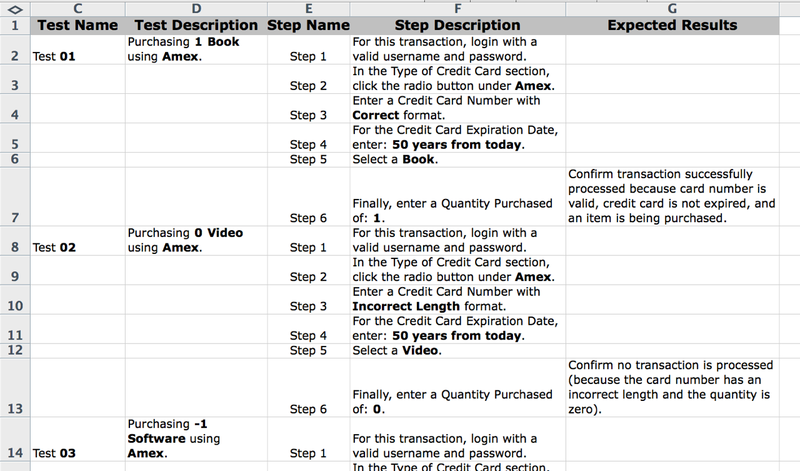 Notice the six test steps per test script, complete with detailed tester instructions (as well as auto-generated "Test Descriptions" and auto-generated Expected Results). 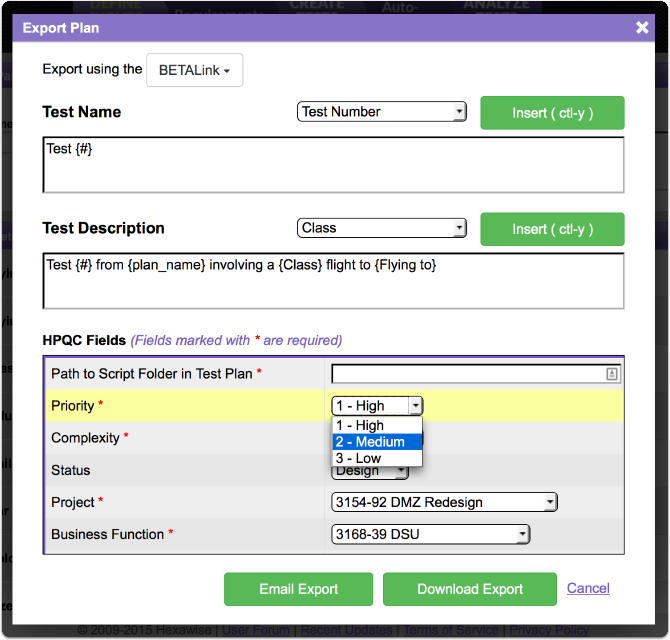 Enterprise Hexawise plans include the ability to export sets of detailed test scripts from Hexawise that are customized for your firm's (or even your project's) exact formatting requirements. Do you have several required fields that must be included in your HQ QC / ALM files? Have several optional fields, too? Have you created customized drop-down lists in HP QC / ALM? No problem. 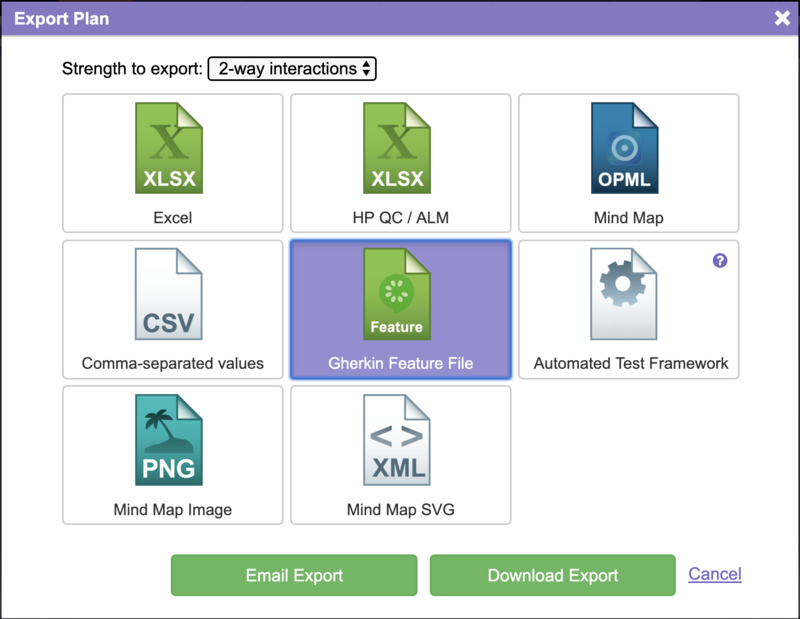 That information can easily be included in your company's Hexawise instance; all of your company's users will be able to quickly format all sets of test scripts generated by Hexawise so that they will be easily imported into your HP QC / ALM instance without additional post-export formatting. Not all users will see this comprehensive functionality. If you are accessing your account directly through hexawise.com you will see more limited "Export to HP Quality Center / ALM" capability. If you are accessing your account directly through a dedicated instance, (e.g., yourcompanyname.hexawise.com), you will, in most cases, see the fully-customizable capability. With Hexawise Automate you can now create Gherkin-style "Given-When-Then" scripts for your tests inside Hexawise. Once written, the Gherkin script and your Hexawise tests can be exported into a variety of formats. The simplest of these is the "Gherkin Feature File" option which exports your Gherkin script and Hexawise test scenarios into a standard Feature file (.feature). 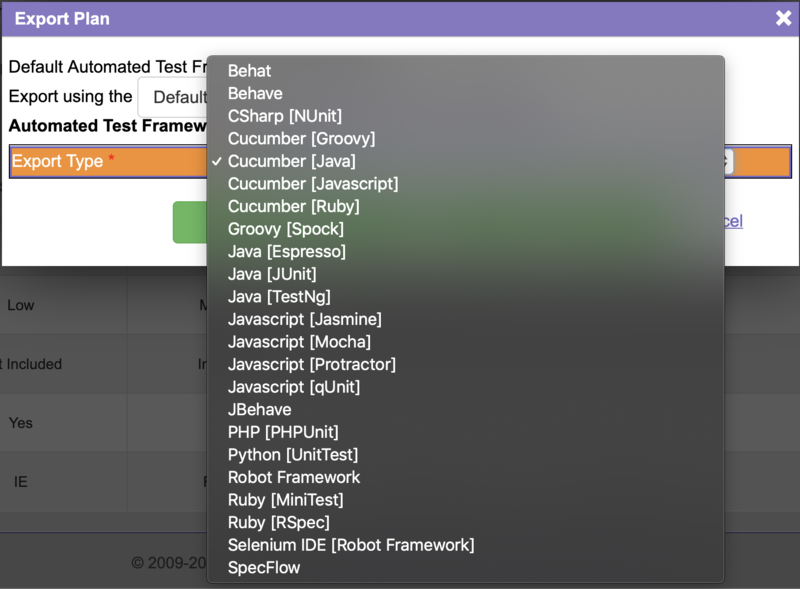 You can also generate the skeleton code for your automated tests in a variety of different automation frameworks/programming languages with the "Automated Test Framework" export option. Upon selecting this option you will see a list of potential frameworks/languages to select from. Choose the option that most closely matches your needs and click "Download Export". 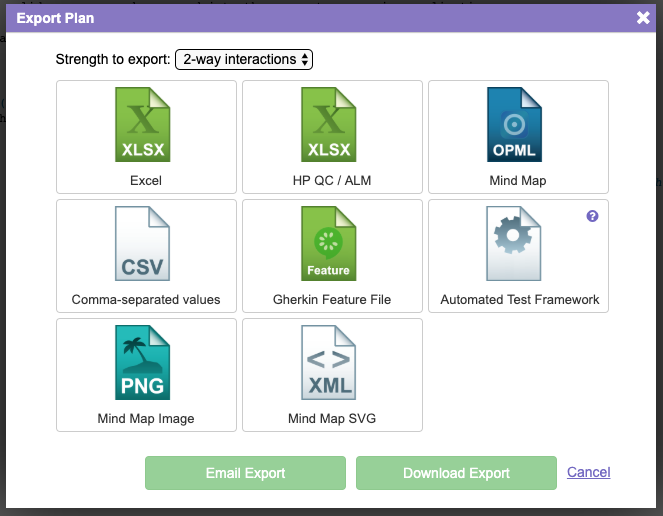 Each export will contain your Hexawise scenarios in the specified automation framework and the "skeleton code" necessary for automating these scenarios (a template in the chosen framework with placeholders for Automation Engineers to define the step definitions and action/key words specific to their system). 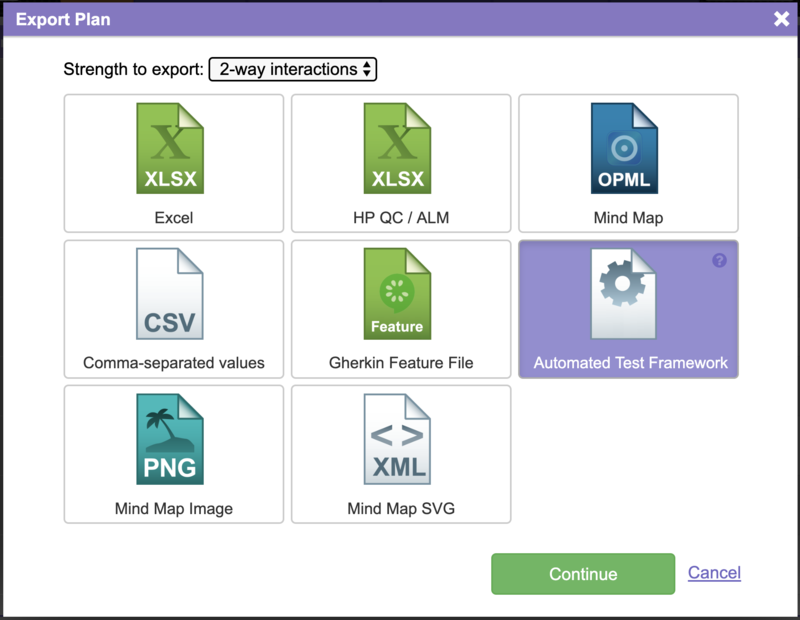 This export option streamlines the effort required to turn Hexawise scenarios into executable automated tests by generating as much of the automation code as possible.